Fannie Flagg’s career started in the fifth grade when she wrote, directed, and starred in her first play, titled The Whoopee Girls, and she has not stopped since. At age nineteen, she began writing and producing television specials, and later wrote for and appeared on Candid Camera. She then went on to distinguish herself as an actress and a writer in television, films, and the theater. She is the bestselling author of Daisy Fay and the Miracle Man (1992), Fried Green Tomatoes at the Whistle-Stop Café (1987), Welcome to the World, Baby Girl! (1998), Standing in the Rainbow (2002), A Redbird Christmas (2004), Can’t Wait to Get to Heaven (2006), I Still Dream About You (2010), The All-Girl Filling Station’s Last Reunion (2013), and The Whole Town’s Talking (2016). Flagg’s script for the movie Fried Green Tomatoes was nominated for an Academy Award and the Writers Guild of America Award, and won the highly-regarded Scripter Award for best screenplay of the year. 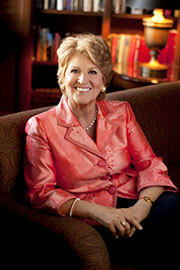 Fannie Flagg is the winner of the Harper Lee Prize. She lives happily in California and Alabama.